Photograph collection of webmaster A relatively clean 25107 at Sheffield Midland station awaits departure. This locomotive was always allocated to LMR depots apart from a four month stint late in 1965 when it was allocated to March. The seventeen year one month career of D5257/25107 included allocations primarily to London Midland Region depots with two brief periods at Eastern Region depots. Time between withdrawal & scrapping: 4 months. September 1965 to March (31B) on loan. January 1966 to Nottingham Division (D16). April 1967 to London Midland (Midland) Lines. May 1968 to Springs Branch (8F). 25107 was the 98th Class 25 withdrawn, the only Class 25 retired during April 1981. 25107 was moved to Swindon Works on August 3rd 1981 and scrapped there by the second week of September 1981. Noted Crewe Works July 1966. Noted Crewe Works September & October 1968. Noted Derby Works September 1972. Noted Derby Works April & May 1974 (Classified ? & full repaint). Noted Derby Works April & May 1977 Classified ? & full repaint). On March 31st ex-works D5253 & D5257 worked the 10.10 Brent to Toton coal empties, a typical duty for the newly arriving Class 25s. The first recorded passenger working for D5257/25107 took place on July 15th (?) 1967 working the 08.00 Leicester - Clacton. On June 13th the 17.30 Manchester Victoria - York was worked by 5257. 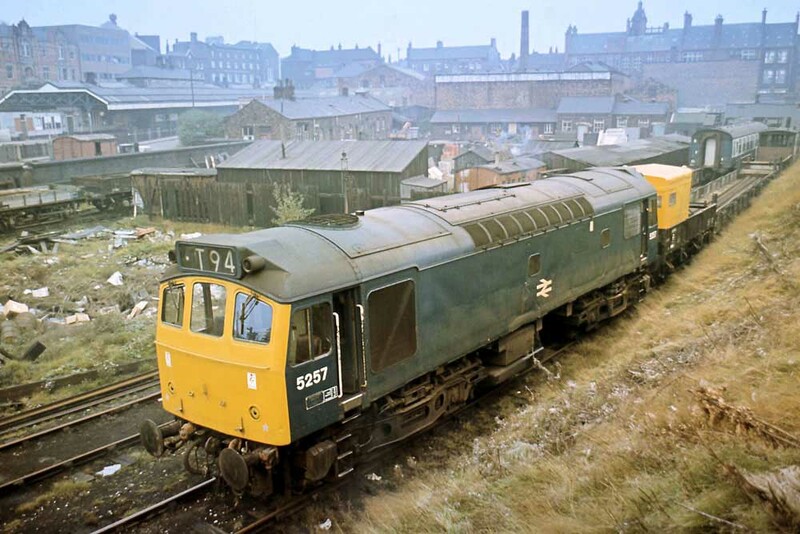 Photograph courtesy Tom Sutch Here is 5257 at Wigan Wallgate sometime during 1972. The T94 job was the Wigan ballast engine and could go anywhere the Permanent Way inspector wanted it. And judging from this view the Class 25 is definately on what appears to be a little used piece of track. On September 12th 25107 worked the 14.30 Weston-super-Mare - Cardiff and the 16.25 Cardiff - Bristol. On September 27th the 08.00 Walsall - Yarmouth to Norwich and the 14.15 Yarmouth - Derby from Norwich were worked by 25107 & 25273. 25107 was noted passing Margam with a westbound freight on March 3rd. The 08.00 Walsall - Yarmouth to Norwich and the 14.15 Yarmouth - Derby from Norwich were worked by 25107 & 25154 on July 10th 1976 and by 25107 & 25123 on August 21st 1976. The latter pair of locomotives worked roundtrip relief Derby - Skegness services on August 23rd & 26th 1976. On May 23rd 25107 & 25123 were noted at the bufferstops at St Pancras station, 25107 was in very ex-works condition. On June 25th 25107 & 25213 worked the Derby - Norwich - Yarmouth - Norwich - Derby (not Walsall) diagram. The next day (26th) the same pair worked a roundtrip Nottingham - Skegness charter. 25107 & 25280 worked a Shrewsbury - Cambridge special on August 10th. On August 20th 1977 the 09.19 Manchester Piccadilly - Yarmouth as far as Lincoln Central and from there the 09.15 Yarmouth - Manchester Piccadilly were hauled by 25107 & 25124. The next day (21st) the same locomotives worked a roundtrip Derby - Skegness, whilst on 22nd they worked a roundtrip Leicester - Skegness. From August 27th - 31st 25107 was paired with 25127 on 27th they worked the Derby - Norwich - Yarmouth - Norwich - Derby diagram. The next four days (28th - 31st), saw four roundtrips to Skegness, one from Derby (a relief) on 29th, the remainder from Leicester. 25107 was noted northbound at Crewe with a mixed parcels vans working on March 4th. 25107 was noted westbound at Nottingham with a short engineers trip working on March 9th. A Nelson - Cheltenham Spa day excursion on May 20th was worked from Wolverhampton to Cheltenham Spa by 25107 & 25270, did they work the return? On June 7th 1978 25107 & 25130 were noted at Skegness on an excursion from ? Three days later on June 10th 25107 worked the summer dated Nottingham - Llandudno Town roundtrip. About a month later on July 15th 1978 25107 & 25239 worked the 09.19 Manchester Piccadilly - Yarmouth to Lincoln Central, they did not work the return leg. On August 26th 1978 the 12.22 Crewe - Cardiff was worked by 25101 & 25107. On September 13th 25107 worked the 4B10 15.52 Bristol - Plymouth vans. The next day (14th) 25107 worked the 19.30 Exeter St. Davids - Paignton. On a wintry January 3rd 25107 was noted at Warrington Bank Quay with an engineers train. On May 5th 1979 a Cardiff - Bridgnorth special was worked between Kidderminster & Bewdley by 25107. The 12.25 Crewe - Cardiff on June 15th 1979 was worked by 25107. On June 30th 1979 the 08.00 Walsall - Yarmouth to Norwich and the 14.15 Yarmouth - Derby from Norwich were worked by 25107 & 25140. The next day (July 1st) the same pair worked the 08.25 Leicester - Skegness to Nottingham, being replaced by 20037 & 20041. On July 7th 1979 sisters 25106 & 25107 worked the 07.50 Cardiff - Crewe. Three days later (10th) 25107 worked the 06.32 Peterborough - Kings Cross. 25107 & 25124 worked the Derby - Norwich - Yarmouth - Norwich - Walsall diagram on August 11th 1979. 25107 was stabled at Cockshute on December 16th. On June 11th 1980 the 16.38 Birmingham New Street - Norwich was worked throughout by 25107. Three days later (14th) 25107 & 25095 worked the 08.02 Walsall - Yarmouth to Norwich and returning from there with the 14.15 Yarmouth - Derby. On July 26th 1980 25107 worked the roundtrip Nottingham - Llandudno Town. The final recorded passenger working for 25107 took place on August 7th 1980 working the 13.40 Manchester Victoria - Llandudno Town with 25191. 25107 was withdrawn on April 30th 1981. At least one cabside number & TOPS panel escaped scrapping. No.1 cabfront: center lampbracket only, other headboard fittings not present: March 1978. Page added October 5th 2013.